Can Carbon Markets Save California's Drinking Water? Can California Tap Carbon Markets To Save Its Delta (And Its Drinking Water)? The inland marshes that provide half of California’s drinking water and support its massive agriculture sector are sinking into the ground and drowning in fertilizer running off from farms. They’re also emitting massive amounts of carbon dioxide, contributing to climate change. Here’s how that could be the key to their salvation. 3 May 2017 | Fifty miles inland from San Francisco, cows are grazing on lush grass, and small purple flowers seem to pop out of every bush. In the distance, a sailboat glides across the treetops – and it’s not a mirage. Sailboat floating through the trees, photo credit by Kelley Hamrick. It’s because I’m looking up. This idyllic farmland is twenty feet below sea level, on a sinking island called Twitchell – one of many in the Sacramento-San Joaquin Delta, where the Sacramento and San Joaquin Rivers converge. This region provides most of California’s drinking water, but the marshes have mostly been drained, and colossal earthen dikes now loom over lowland farms, guiding massive amounts of water towards the coast in man-made streams that crest above the roofs of farms that now cover most of the delta’s 738,000 acres. Farming here is a double-edged sword. As farmers churn up the peat soil to dry it for planting, the carbon in it reacts with oxygen in the air to form the greenhouse-gas carbon dioxide (CO2), which is soon gone with the wind, along with the soil. Because soil keeps disappearing, farmers keep digging it up, and the islands keep sinking – threatening both their own livelihoods and the entire state’s drinking water if those levees ever give way on a big scale. They do, in fact, fail occasionally. What they don’t see are the invisible greenhouse gasses that emerge from the delta and drive climate change. Yet those gasses may, ironically, be the region’s salvation – if people here can tap carbon markets to finance a complete restructuring of the way it manages its land. To do that, however, they must first develop something called a “carbon methodology”, which is a set of rules for building carbon offsets, and that’s no easy task. A carbon methodology begins by quantifying not just the emissions, but man’s impact on the emissions and the impact of various activities. That’s where Deveral and HydroFocus come in. Pumps that remove water from Twitchell Island, photo credit by Margaret Williams. They spent the last four years working with administrators from the Sacramento–San Joaquin Delta Conservancy, scientists from the University of California Berkeley, consultants from Tierra Resources, and the American Carbon Registry (ACR) to develop a carbon methodology tailored to this region. The ACR has historically developed methodologies for voluntary offset projects, and now it also helps projects become eligible for California’s carbon trading program. 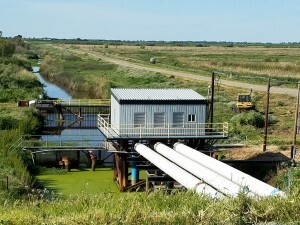 Last week, it approved a methodology that will make it possible for landowners across the delta to earn money by “rewetting” parts of their land. Governmental agencies and NGOs have already said they hope to tap the new mechanism, but it’s not clear farmers will want to fill in some of the swamps their ancestors spent the last century draining. The drainage began shortly after the 1849 Gold Rush, which drew hundreds of thousands of prospectors to the San Francisco area. 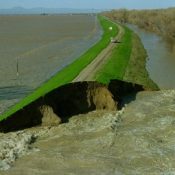 Most failed to find gold, and many of those who stayed began draining the marshes – a back-breaking effort that required the digging of irrigation canals and the forming of sediment into more than 1000 miles of levees to hold back the water, creating over 60 dry islands. Then they planted crops in the thick, rich peat. Soil from wetlands is a bit different than soil you might encounter in your garden. Since the soil is constantly covered in water, it receives less oxygen and stores more carbon. To dry the soil, farmers drained it and exposed it to air before planting, which leads to that process we described above – technically called “oxidation” – that creates CO2. Parts of the soil literally disappear during this process, meaning that farmers dig a little deeper each year and oxidize more soil. 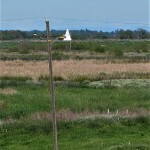 “Great big bowls just sitting there,” says Campbell Ingram, who runs the Sacramento-San Joaquin Delta Conservancy, which is a state agency charged with restoring the delta’s degraded ecosystems – a restoration that often means rewetting swamps by leveling the levees and filling the drainage ditches. Twitchell island is one of many “bowls” in the delta, just waiting to be filled. And that brings us to the second problem. As farmers planted and harvested crops over the years on the delta’s islands, the state government tapped the delta’s freshwater water to quench its thirst. 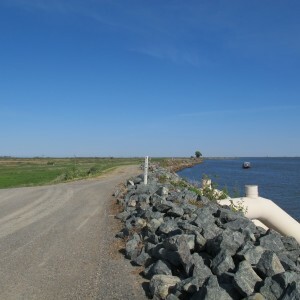 Today, water diverted from here supports much of the state’s $27 billion agricultural sector, and more than 22 million people rely on the Sacramento-San Joaquin Delta for drinking water, while the mingling of freshwater from the rivers and saltwater from the sea supports the West Coast’s largest estuary. But all this has come at a price: by diverting freshwater, more and more water can creep in from the sea. At the same time, many of those levee-protected islands are now more than 20 feet below sea level. If the levees break, the islands will drown, and the state’s drinking water can suffer unprecedented levels of contamination from seawater pulled even further inward into the delta. Despite the manpower, he says, it would only take one catastrophe – an earthquake, an intense storm, or rising sea level – to upset this delicate balance and create a saline inland sea. That’s where wetlands can help tip the balance: they can reverse subsidence, the gradual land sinkage. 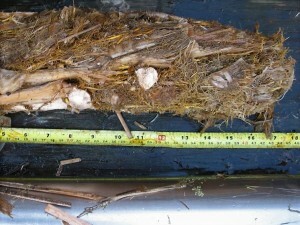 This shows the accretion, or gains, in biomass from one of the pilot wetlands on Twitchell Island. Photo credit by Steve Deverel. 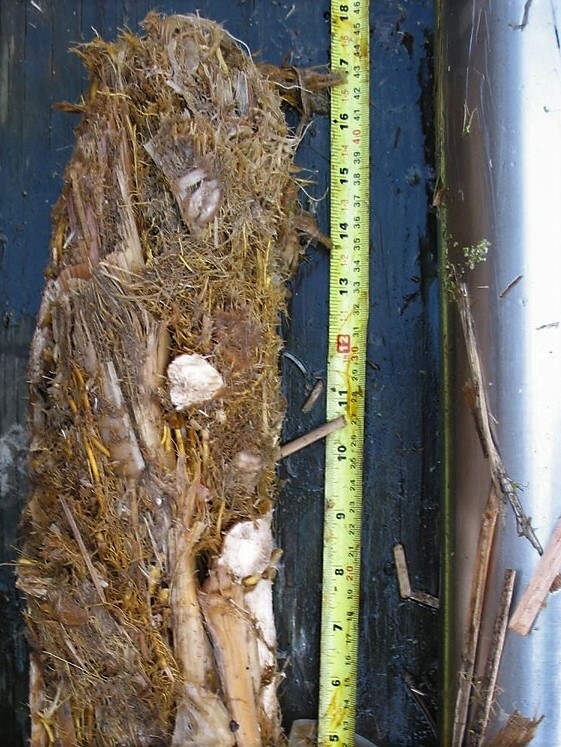 Managed wetlands deposit dead plants on the bottom of the water, adding up to three centimeters of soil per year. They are, however, neither easy nor cheap to create, which is why local authorities started looking to carbon markets. 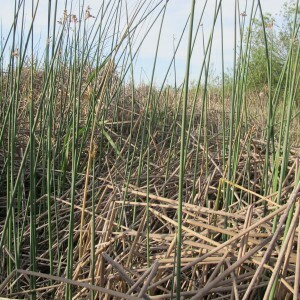 “State and federal funding remains insufficient to address land subsidence that threatens the California water system, and carbon market revenues could help fill the funding gap,” said Ingram said last Tuesday as the ACR approved the methodology for generating carbon offsets by converting sunken farms to managed wetlands or rice plantations in the Delta. Those offsets can then be sold to people and companies looking to reduce their carbon footprints – initially through the voluntary carbon market, and perhaps through the state’s cap-and-trade program, under which power plants and oil refineries are required by law to reduce or offset their emissions. The idea started in the 1990s, but gained traction in 2008, when California passed the legislation that governs its cap-and-trade program. In 2013, a Louisiana company called Tierra Resources received approval for a wetlands methodology that it’s now using to restore degraded marshes in the bayou, inspiring the Delta Conservancy to begin pushing for the creation of a similar methodology in California. The Conservancy partnered with HydroFocus, which developed the procedure in cooperation with the University of California at Berkeley and Tierra Resources. Funding for the methodology was provided by the Sacramento Municipal Utility District (SMUD), the California Coastal Conservancy, the Metropolitan Water District and California Department of Water Resources (DWR). With the help of data collected by UC Berkeley and the US Geological Survey over the last twenty years, Deverel and his team estimated that each acre converted to wetlands keeps about five tonnes of CO2 out of the air per year compared to those acres kept for agriculture. New carbon methodologies always take time to develop because the science needs to be solid. But “this is one of the most lengthy and complex methodologies we have,” says Margaret Williams, the program officer at ACR responsible for helping the delta methodology gain approval. 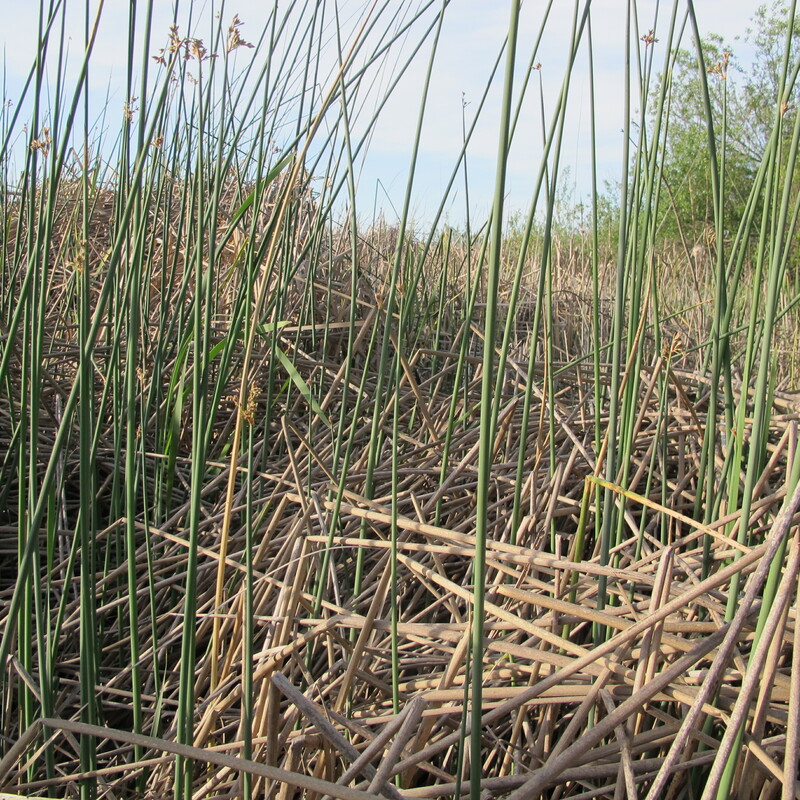 Fortunately, because the delta is so important to California, it’s been the focus of intense research that’s yielded reams of data; but the teams still had to conduct exhaustive site-sampling and build pilot wetland restoration projects to collect data specific to the methodology. Now, Deverel and Ingram hope to use the methodology for a real project that will generate verified offsets. That will mean first identifying a site, then coming up with a plan, and finally bringing in third-party auditors to validate the plan and verify the results. They’re currently looking at public lands as well as some owned by non-profits, but they’ll need the participation of private landowners to really get the job done. “The Delta is emblematic for water problems throughout California,” he says as we walk along a narrow wooden plank, erected at the beginning of the first wetland he helped restore. The path is almost overrun by nature now, and cattails and tules that began to emerge after rewetting 20 years ago now reach far over my head. He leans down to scoop up some soil. It’s a goopy black, saturated with water. This is soil that won’t oxidize upon contact with the air – it’s too wet. Reading this brings to mind the thought that sequestration is the idea of locking carbon away from the atmosphere. I had long thought of working ag waste into the soil and soaking it regularly to enhance decomp as one method. right now when vineyards or orchards are removed in normal farming the material is typically shredded in a monster grinder. Some is then composted and mixed with other stuff to make some potting soil. Or it is burned in small power plants that can handle the woody material as feed stock to make electricity. One concern with just spreading the raw mulch is the spreading of disease. Composting it can mitigate, but there is no certainty it is disease free stock. Composting is a natural process that produces CO2 and CH4, methane, both of which are greenhouse gasses. Burning it just releases the CO2 back to the atmosphere. I expect the scattering of such shredded woody ag waste in the bogland might speed up the process if it can be added in a suitable amount. Too much may fully interfere with the process slowing down the conversion over time. Overall, however, I expect this could enhance building the bog material at a faster rate. Experimentation will be needed to see it it works and to see if it results in destruction of fungal, bacterial and viral pathogens. ← Will New French President Keep Pledge To Hire US Climate Workers?